For Plugin permissions and credits, refer to me and Savage Hammer. Savage Hammer, for the original plugin/mod and concept. Created a new custom enchantment to replace the default one on the Archmage's Robes. Created new custom magical effects to be a part of that new enchantment, adjusting values to prevent value exploitation. Made it possible to disenchant the Archmage's Robes. Made it possible to then enchant said enchantment onto other chest items. Incorporated USSEP description changes into the mod (minor grammar corrections), but not the name change cus, I mean, why? Adjusted the Light variant to be a bit weaker: All spell cost reduction reduced to 20% from 22%. YES! This has been run through the SSE Creation Kit! Still on classic Skyrim? Better Archmage's Robes - Cleaned is what you want! 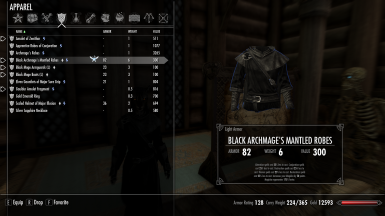 Better Archmage's Robes has always been a fixture in my mod list for mages. While I've been using tools for a while to merge small changes together, it's only recently that I started bothering with learning how to clean them. When I got around to this one I noticed it had header corruption and some incomplete entries, probably due to being made before the Creation Kit came out, so I cleaned it up! And now that Skyrim Special Edition is out, round two! Vanilla Archmage's Robes - All spells cost 15% less to cast, +50 magicka, and magicka regenerates 100% faster. Master Robes - Single school of spells cost 22% less to cast, and magicka regenerates 150% faster. Main - All spells cost 25% less to cast, +50 magicka, and magicka regenerates 175% faster. Medium - All spells cost 25% less to cast, +50 magicka, and magicka regenerates 150% faster. Medium Light - All spells cost 25% less to cast, +50 magicka, and magicka regenerates 125% faster. Light - All spells cost 20% less to cast, +50 magicka, and magicka regenerates 125% faster. Or, if you have the Unofficial Skyrim Special Edition Patch, the hoodless robes can also be found in the Archmage's Quarters. These hoods can be worn with a circlet as well! 1.) Enchantments on created items are baked into your save. -- If you install one version of BAR, disenchant the robes, then apply it to an item, that is the version of the enchantment that item will use from now on. 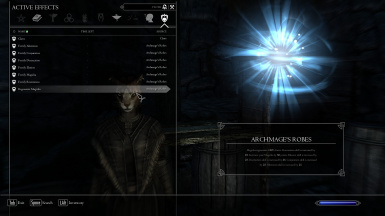 Skyrim saves any custom enchanted items as the magic effects of the enchantment, and magnitude (power) of said effects, not as the enchantment itself. The learned enchantment at the table will still update as normal, ready to be placed on any new items. 2.) "My save says _______.esp is missing!" -- You updated from one of the optional weaker versions pre-Version 1.1.1. The plugin filename has been changed to match across all versions in order to preserve your learned enchantment at the table. Have no fear, your Archmage's Robes should adjust normally! If you've already disenchanted them and applied the effect to a new robe or piece of armor, see Known Issues #1. 3a.) "The Archmage's Hood says it gives the 25%/+50/175% values, but I'm not using that version of the robes!" 3b.) "The Archmage's Hood looks like the full robe in my inventory or when I drop it!" -- No worries, it's just a display issue. Everything is working right behind the scenes! If you're still worried, just put the item on and check your magic effects! 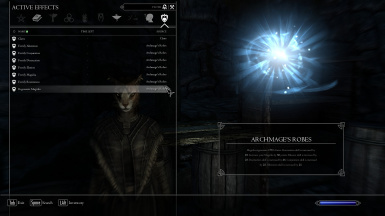 -- Rather than having the enchantment description on the enchantment (which could then carry over to the item), Skyrim uses the item's description for the enchantment text. Since the hood uses the same enchantment as whatever version of the robe you have installed, but its own static description, the hood's description may not be right if you use anything other than "Main". Having a single file is for simplicity, but hoods may be merged into the main files in a future update. As for appearance, the hood uses the same world model as the robes for now, which may also change in a future update. 1.) "Can I install this without starting a new game?" -- Ab-so-lutely! There's no scripting or locked-in values from the vanilla game, so any time you feel like using it, you can! 2.) "Can I uninstall this mid-game?" -- Yup, go for it! The values on the Archmage's Robes you have will revert to their originals. If you disenchanted a set, you'll unlearn the enchantment with no problems. You'll have to get yourself a set of fresh robes though! -- Anything you may have enchanted with the Skein of Magnus effect will continue to have the properties of the version of the enchantment you placed on them. For more information, see Known Issues #1. 3.) "Can I switch versions mid-game?" -- As much as you want! Your robes will update, your learned enchantment will update, but any items you enchanted with the Skein of Magnus effect will keep the effect they had previously. -- Updating equipment with this enchantment those requires re-enchanting. For more information, see Known Issues #1. Just want the enchantment without the my changes? Chivels has you covered! Don't like how the Archmage's Robes look? DryreL has a solution for you. Reko provides robe-like alternatives and armors of various kinds for the more discerning mage! Are you running a battlemage and want a heavier look? Waka's outfit has the heavy armor appearance without the weight! 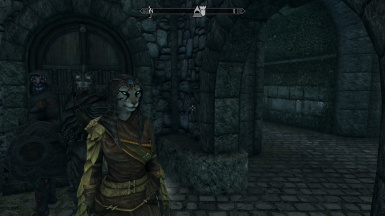 Zalyana's cats vary in head shape are fantastic for adding some new faces across Skyrim and beyond. Multiple years in the making and the love child of blood, sweat, and tears, what Nightro's Khajiits lose in head variation they gain in insane quality. I can't even begin to describe the love I have for KO, as I'd been marveling over the original models since they were just a modder resource! 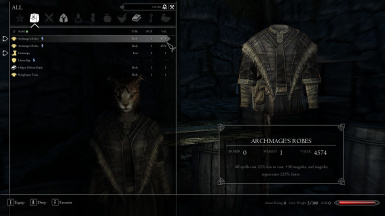 They DO work with Catlike Khajiit with a little fuss (though you lose the super HD quality of Nightro's work), and I may release a patch in the near future. All thanks to Savage Hammer for the edits that made the Archmage's Robes actually worth wearing, and for permission to upload an update! Making the archmage's robes disenchantable, allowing the resulting enchantment to be placed onto any chest item, making that enchantment as unexploitable as possible, and importing the USSEP description changes? I finally become archmage & recieve new robes with the job. But why are the robes weaker then expert mage robes. 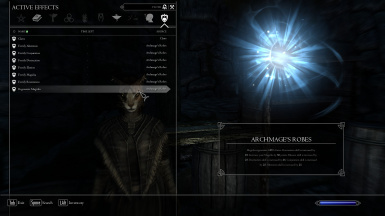 This mod fixes that & makes the Archmages Robes worthy for a master of the mystic arts. This mod improves the enchantments of the Archmages Robes to be slightly better then master mage robes. This also adds the missing +50 magicka enchantment to the hoodless version. Vanilla - All spells cost 15% less to cast, +50 magicka, and magicka regenerates 100% faster. Light - All spells cost 22% less to cast, +50 magicka, and magicka regenerates 125% faster. Medium2- All spells cost 25% less to cast, +50 magicka, and magicka regenerates 125% faster. Use mod manger or place contents into Data directory. Remove files from Data directory. - All spells cost 22% less to cast, +50 magicka, and magicka regenerates 125% faster. - All spells cost 25% less to cast, +50 magicka, and magicka regenerates 150% faster. - All spells cost 25% less to cast, +50 magicka, and magicka regenerates 125% faster. * Fixed enchanments for medium versions.